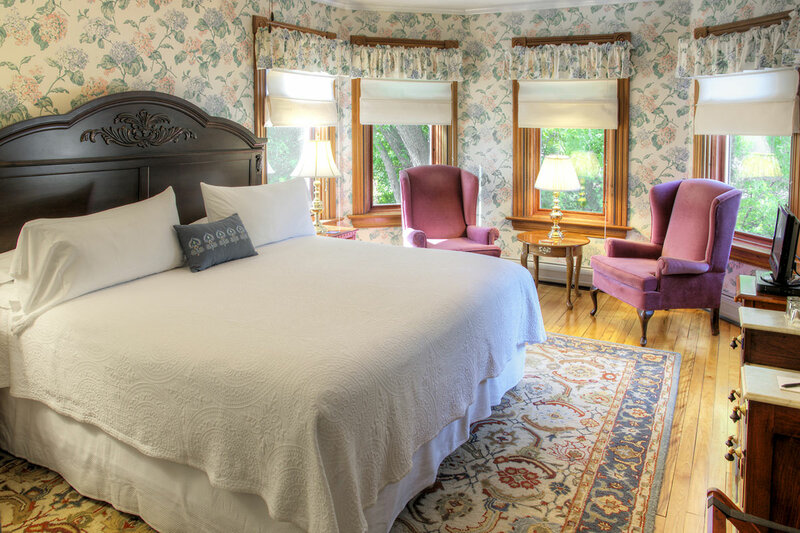 Our rooms offer a variety of decors, sizes, types of beds, and location within the inn to meet your needs. Each room has Direct TV, custom shampoo and soap, hairdryers, robes, slippers, duvets, plush Sealy Posturepedic mattresses, and free WIFI. 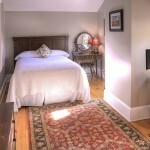 All rooms have individualized heat and cooling controls. 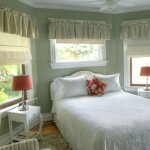 Color pictures and details of the individual rooms are provided below. A large Victorian room with many windows looking out over the pond, waterfall, and gardens. It has a king-size bed and private bathroom. This first floor room is fully accessible with widened doorways for a standard wheelchair. The bathroom has a large, roll-in shower with grab bars for those who may need this type of accommodation. A bright, large room at the top of the stairs with several windows that also offer a view overlooking the pond and gardens. Two comfortable chairs and plenty of space. 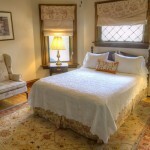 It has a king-size bed and private bathroom with a shower. 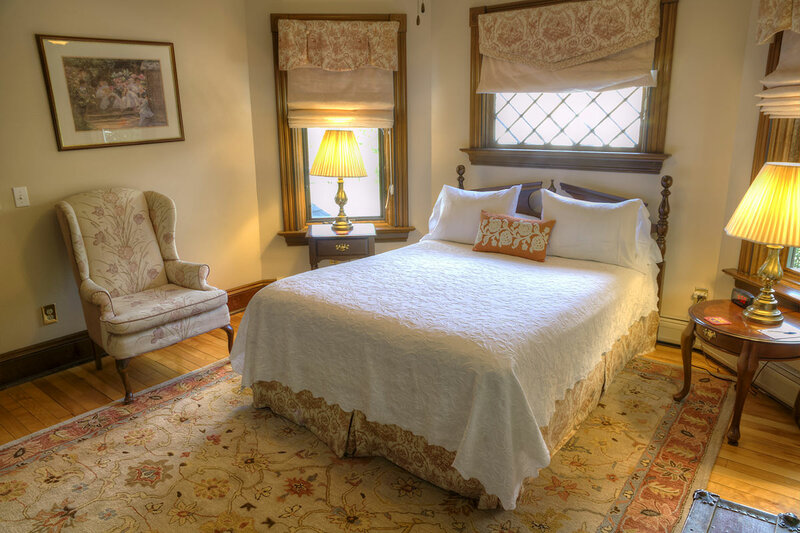 Located at the front of the house with ample room to relax, this room has four windows, including one with the original diamond stained-glass panes. It has a king-size bed and a private bathroom and shower. 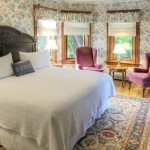 A cozy turret room also with an original stained-glass window. 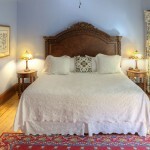 Has a queen-size bed, reading chair, and private bathroom with a shower. 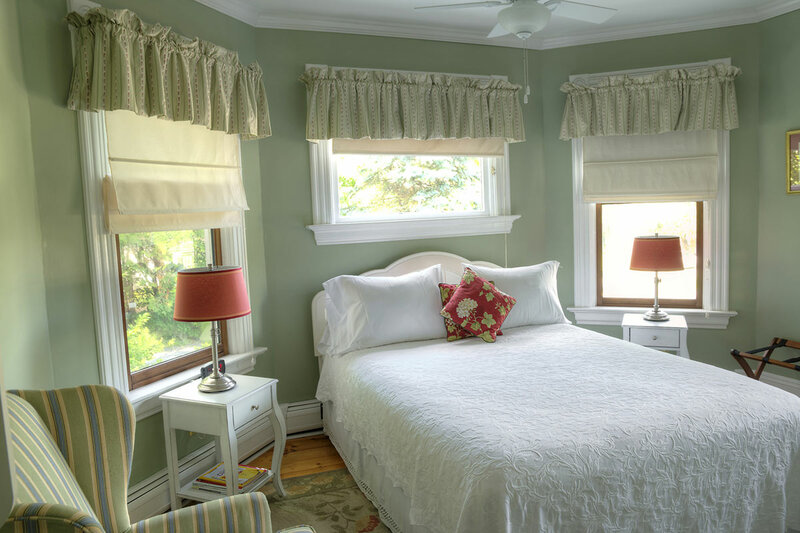 A spacious room decorated with hydrangea wallpaper, comfortable chairs and five windows to let the light in. 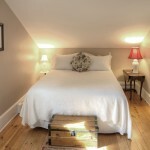 It features a king size bed and private bathroom with a shower/tub. Well-suited for a pair of travelers or a couple and a child. 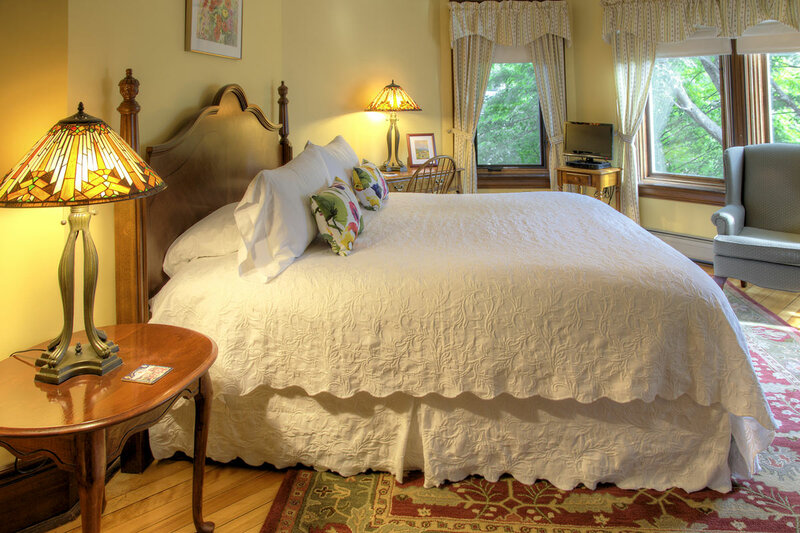 Both a queen-size bed and a full-size bed welcome you with a view over the valley behind the house. Enjoy the space, privacy and private bathroom with a shower. 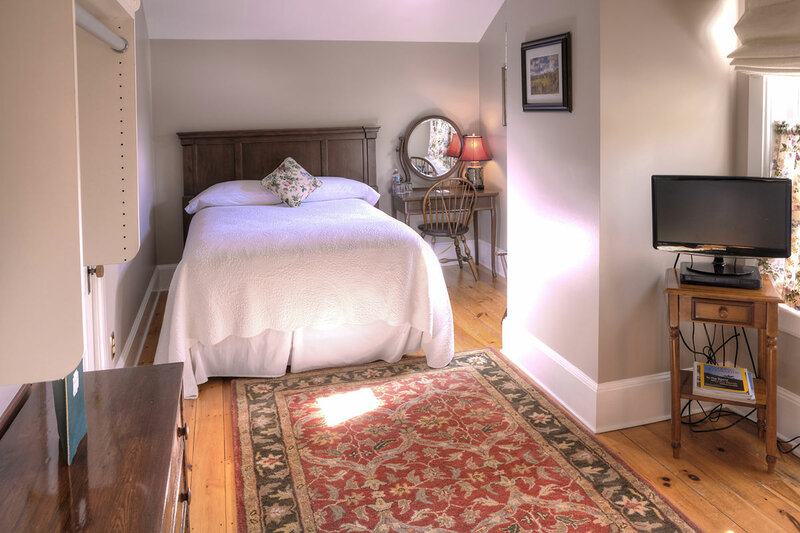 Rates include a fully served gourmet breakfast served between 8:30 and 9:30 AM, complimentary beverages, and home baked goods for afternoon/evening snacks. 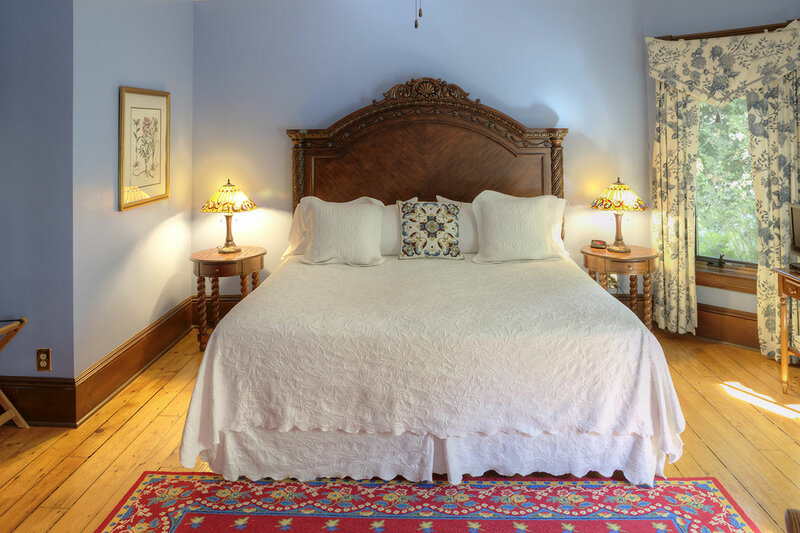 Room rates vary depending on bed size and season, and may at times require a two-night stay. Guests are welcome to have their friends/relatives for breakfast for an additional charge of $10/person, if space permits. Discounts are available for active duty U.S. Military Personnel, friends/family of local area residents, College Parents, and Extended Stays. Special Events (e.g. birthdays, reunions) that book the entire inn may also receive a discount. Blocks of rooms booked for special events, wedding guests, etc., may have a different reservation and cancellation arrangement. We also can provide discount tickets for the Shelburne Museum and some ski areas. Reservations are recommended well in advance for holidays, weekends and the foliage season (mid September through mid October). Call (802) 899-2234. All reservations can be confirmed with a credit card. There is no room charge for canceling more than 7 days (30 days for some events) before your scheduled arrival date. If the reservation is canceled less than 7 days prior to your arrival date you will be charged 50% of the total reservation unless we are able to re-book the room. Failure to show on your day of arrival, or cancellation after arrival will result in the system automatically charging your credit card for the full reservation. Check-in time is 3 PM on the date of arrival. If you plan to arrive after 7 PM or before 3 PM, please call us so we can make alternative check-in plans, if necessary. If we do not know your arrival time and we have not heard from a guest by 8 pm, we will assume that the guest is a “no show” and will release the room and charge the credit card on record. Check-out time is 11 AM. Smoking is allowed outside the inn. Use of candles anywhere within our B & B is not permitted under our insurance coverage. Children of all ages are welcomed. Please keep pets at home, as we are not able to care for them properly at the inn.